After breakfast of sliced meats, cheeses, oatmeal (really bad) and waffles (quite good), at the Country Hotel Höfðabrekka (this was the only place we stayed that did anything inventive like waffles or oatmeal), we headed out from Vik through the wasteland. 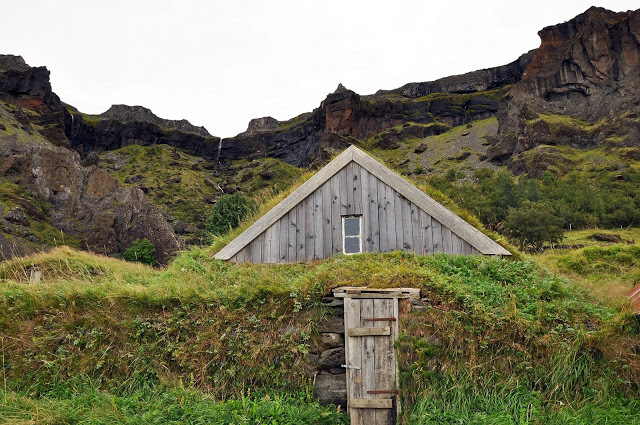 Technically, the drive from Vik to Hofn is not a wasteland – it’s a sandur. 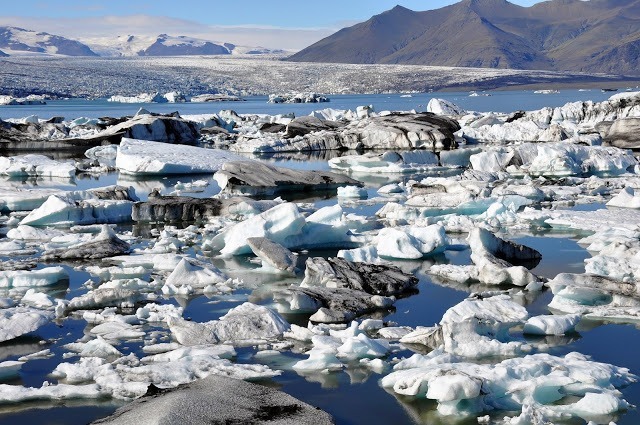 A sandur is a plain formed of sediment that’s deposited when part of a glacier melts — nothing grows there. Our drive included two of them. It was a desolate landscape to travel through, and winds tend to whip across the plains. Our first stop was Kirkjubaejarklaustur for the Systrafoss waterfall (yes, we do have to look up the spelling of each one of these names before we write them). It was on the smaller side and basically seemed to be in someone’s backyard. If we hadn’t seen other huge waterfalls throughout the country (like Gulfoss and Skogafoss), I’m sure this one would have been more impressive. Just after passing the second sandur, we happened on an old abandoned farm comprised of turf buildings. The area is called Nupsstadur. The buildings, which are likely from the 1600s, were all private and marked no admittance, however, there was a small chapel built for two people where you could go in, pray and leave an offering. The area was an unexpected find and had some of the only turf churches left in the country. Once past there, we drove out across the last sandur to the Skaftafell National Park (now absorbed into the Vatnajokull National Park). 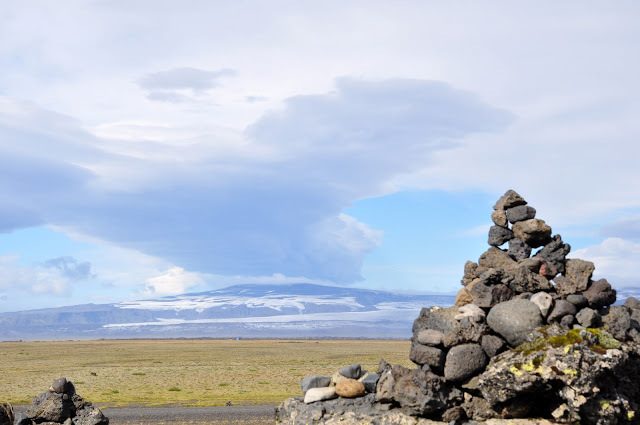 At the Visitor Center, we learned about the 1996 eruption that basically washed out the whole area we had just driven through (it also turned out that this was the largest sandur in the world). From the Visitor Center, we drove a few kilometers up the valley to the car park and headed out on a hike to Svartifoss. 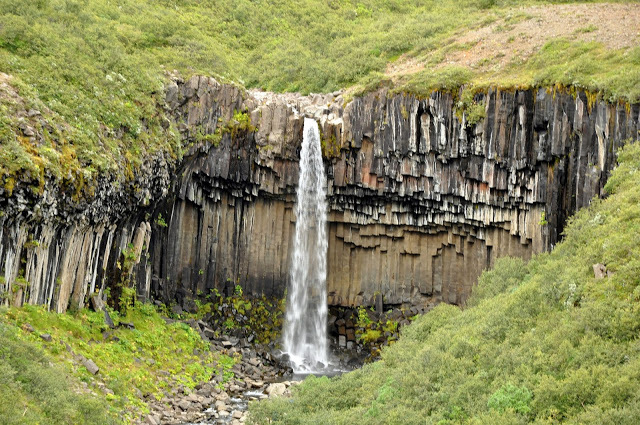 Svartifoss is a small waterfall in terms of both height and water volume, but it was unlike any others we saw in Iceland because the water falls off cliffs of black basalt columns. The hike from the car park was 1.4 kilometers each way and took us about 2 hours (including time to stop at the falls). 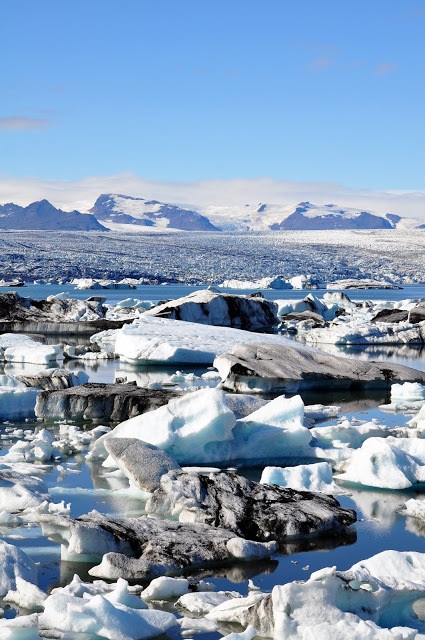 As we continued our way North, we made several stops along Lake Jökulsárlón. This place is surreal – massive chunks of ice the size of homes and buildings fall off the glacier into the Jokulsarlon lagoon and then drift several miles towards the sea. There are several spots along the lake to take in the vistas. We took numerous pictures of the icebergs and then tried to capture the seals at play. This spot is like no other place on earth. We checked into our hotel Brunnhóll in Mýrum. The hotel sits out in the middle of nowhere, about 50 kilometers south of Hofn. Now, our “hotel” Brunnhóll is a working dairy farm. On the TV, you can watch about 6 different views of closed circuit TV inside the barn as the cows are fed and milked – all live action. They make ice cream, which is delicious – we indulged twice. The rooms were clean, comfortable and quiet. Really an awesome and unusual place to stay. For dinner, we drove into Hofn to the oft-recommended Kaffi Hornid. Given the disappointment of the previous evening, we were thrilled with our experience tonight. I got to try one of the local Icelandic beers – something called an Egils. It was pretty decent. Dinner was the house specialty – langoustines in cream sauce. They were excellent! (The langoustines in cream sauce is better than the langoustines in the garlic sauce). And the kitchen opens the shells so they were very easy to eat. It was positively delicious! After dinner, we headed back to the hotel for a little ice cream, some cow watching and bed. 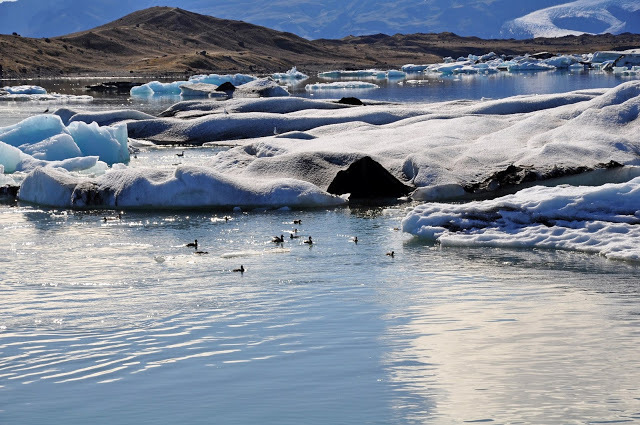 What do you think about The Sandurs and Glacier Lagoon of Southern Iceland? 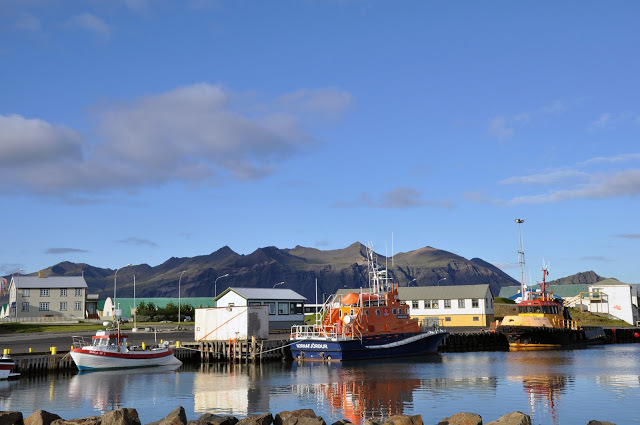 We’re spending three nights in South and East Iceland this summer on our ring route trip so this post was very helpful! I’m planning our trip using only personal travel blogs; your posts are so organized and detailed. Thank you! This is an amazing post! Thanks for bringing it to my attention. I’ve added it as a feature blog for August Travel experiences. Thanks so much for your great work. Thanks for the link Brad. 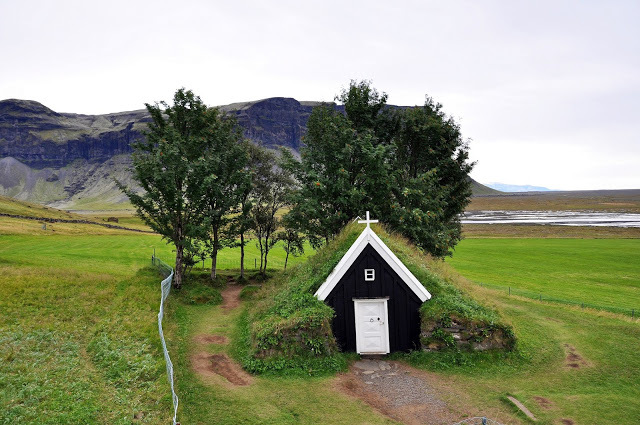 We’ve got lots of other great Iceland posts you might want to check out. I’m looking forward to reading your next Wanderlist installment!